Today we have a guest post from Chuhong Mai, an undergraduate student working on Planet Four this summer as part of the ASIAA Summer Student Program. By now, you may have helped the Planet Four team classified hundreds of thousands of cutouts produced from HiRISE season 1 to 3 products, and you may have voted for a region target for HiRISE to be observe in season 5, however, but how well do you know about this camera that makes the whole Planet Four project possible? And that’s what this blog post is going to talk about. The High Resolution Imaging Science Experiment (HiRISE) camera is carried on the Mars Reconnaissance Orbiter (MRO) spacecraft and since the spacecraft entered Mars orbit in 2006, HiRISE has produced a large amount of beautiful images in unprecedented detail. It was in a 2-year Primary Science Phase (PSP) during 2006 and 2007, corresponding to season 1 in Planet Four project. Later, it had two 2-year Extended Science Phases (ESP) in 2008-2009 (season 2) and 2010-2011 (season 3). HiRISE continues today to operate under an extended mission taking images of unprecedented detail. So if you notice the images’ names (not the cutouts’ names), you’ll find all of them begin with PSP or ESP, which indicates the mission phase HiRISE were in when a certain picture was taken. The rest of their names tell you some other information of HiRISE’s orbit. The HiRISE camera mainly consists of a telescope with 50 cm diameter and a focal plane system right behind it. This plane might be one of the most important parts of HiRISE since 14 CCD detectors are installed on it, each with 2 separated output channels and 2048 pixels. 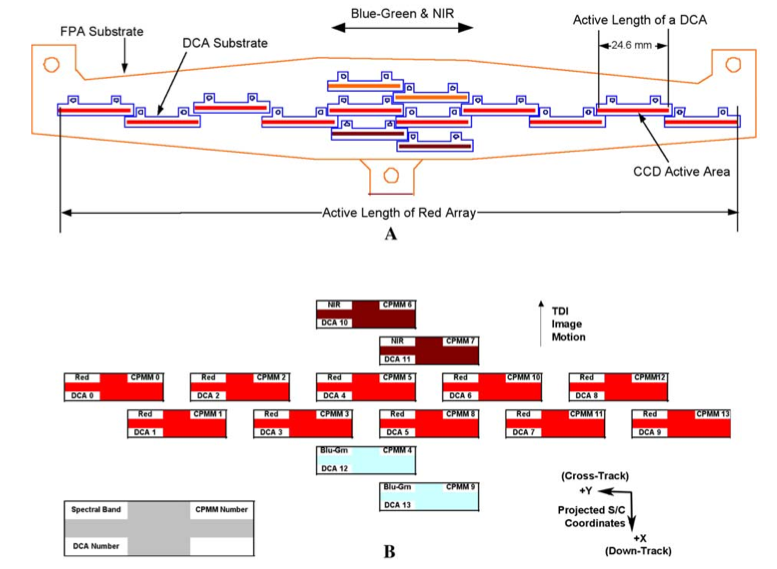 10 of these CCDs are for the Red band (RED0 to RED9), 2 are for the Infrared (IR) band (IR10, IR11) and the rest 2 are for the Blue-Green (BG) band (BG12, BG13). They overlap each other by around 48 pixels. Their positions are shown in Fig.1. So as you see, the red band will cover a much wider range (5.0-6.4 km wide) of Mars surface than the other two bands, but only RED4 and RED5, which locate at the center, can cooperate with IR and BG band to generate color products (1.0-1.3 km wide). The HiRISE team also use Time Delay Integration (TDI) to increase SNR (Signal-Noise Ratio). The basic idea of TDI is to image the same small patch of surface many times and add up together to improve SNR. Different numbers of TDI lines (8, 32, 64, 128) are used under different conditions. In addition, six pixel binning modes can be used to increase coverage and SNR, either. Click here to learn more about how binning works. On the whole, HiRISE is able to reach a high resolution: 0.25m/pixel with low SNR exceeding 100:1. This makes sub-meter surface study of Mars possible. The three bands are selected to differentiate a broad classes of surface materials like bedrocks, frost or ice, sand, dust and other minerals and to avoid ambiguities between shades and different materials, which is often the case in grayscale products. Typically, frost and ice appear bright white and blue, sand and rocks appear bluer and darker, while the dust are the reddest material in these images. Therefore, with these bands combined together, a final color product you see are usually not a true-color images (like what you see through naked eyes), it is either an IRB product, which combines the 3 bands mentioned above, or a RGB product, which combines the Red, BG and synthetic blue band. The latter one is used by Planet Four to make cutouts for you, as RGB images usually do better in contrasting RED with BG color variations. Note again that these images are false-color products and the true Mars surface appear relatively bland and red. Sorry about that because how beautiful these cutouts are!